Getting started with the right techniques – and in the right places – takes time. Use our walkthroughs to start off on the right foot. The Mulva Library gives you access to books, e-books, movies and more to support your research efforts. Use our tips below when you’re looking for materials in the library, elsewhere on campus or through other libraries. You can search materials specifically available on campus using the SNC catalog. Start at the library homepage in the “Search Books” section. 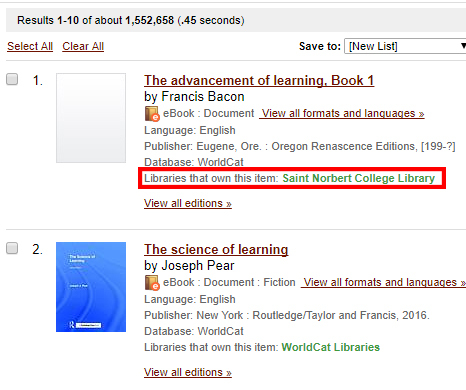 Make sure your selection is SNC Catalog, not WorldCat, before typing your terms into the search box. Materials related to your search terms will appear in a listing. Click on your desired title to see a full record including the item’s location on campus, call number, availability status and format – book, e-book, DVD, etc. You can also click the “Request” link toward the top of the page to reserve it and pick it up at a later time at the information desk in the library. You’ll need to log in using your name and the barcode located on the back of your SNC ID card. If you need to update your search, you can click the “Modify/Limit/Sort Search” link toward the top of the page to refine your search terms or limits (author, year, format, location, etc.). We also recommend using the catalog when you know you need a book or other item as soon as possible or need materials specific to the Norbertine Order and college history. WorldCat gives you access to search books that may be available to borrow through our partner libraries. 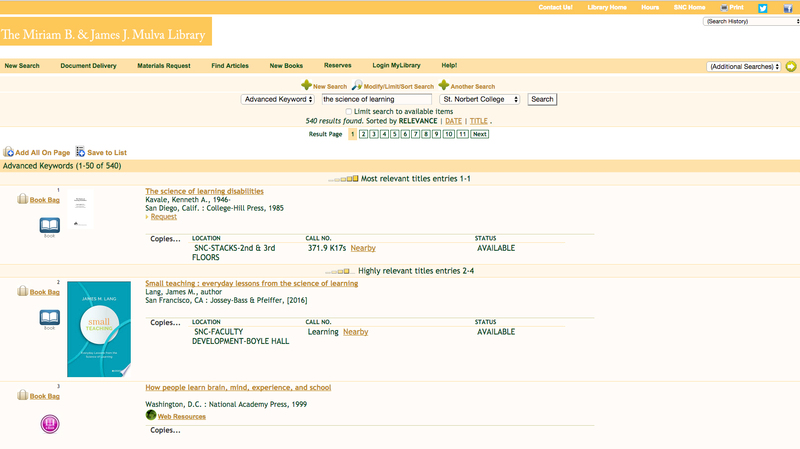 Begin on the library home page in the “Search Books” section. Change your selection to “WorldCat” before typing your terms into the search box or access WorldCat directly. Materials related to your search terms that are available on campus will list “St. Norbert College Library” in the “libraries that own this item” field. Click on your desired title to see a full record including the item’s location, availability status and call number, which will help you find it in the library or elsewhere on campus. You can also click the “Place Hold” button to reserve it and pick it up at a later time at the information desk in the library. If you need to update your search, you can revise it at the top of the page or refine your search terms (author, year, format, etc.) using the boxes on the left-hand side of the page. Any materials listed available as part of “WorldCat libraries” can be ordered for you through document delivery. If the materials you’re looking for aren't available in our library, simply click on your desired title and submit your request by clicking the “request item through Document Delivery” button. If you need help submitting a request, check out our guide or contact Connie Meulemans, document delivery specialist . Have questions about finding materials or need additional assistance? Contact our staff at the information desk at library chat, 920-403-3466 or library@snc.edu. Need guidance on search terms or honing your research approach? Ask a librarian.